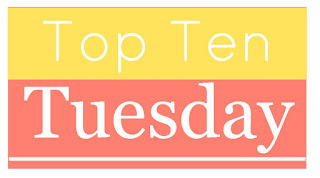 Bloggin' 'bout Books: Top Ten Tuesday: Food, Glorious, Food! Before we get to that, though, I want to encourage you to join in the TTT fun. All you have to do is click on over to The Broke and the Bookish, read a few quick guidelines, make your own list, and join the party. It's a great way to discover new book blogs and add exciting new reads to your TBR mountain chain. C'mon, you know you want to! 1. The Wedding Bees by Sarah-Kate Lynch—I'm not a big honey fan, but this cover is scrumptious-looking! The story sounds good, too. It's about a woman who lets her queen honeybee choose where she's going to live next. 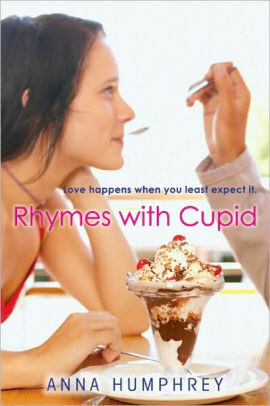 She ends up in New York City, where she brings together a group of neighboring misfits through the magic in her honey. 2. The Coincidence of Coconut Cake by Amy E. Reichert—This novel looks delicious all around. It's a romance about a chef and the restaurant critic who's trying to ruin her career. A case of mistaken identity leads to love, but can this new relationship survive once the truth comes out? 3. 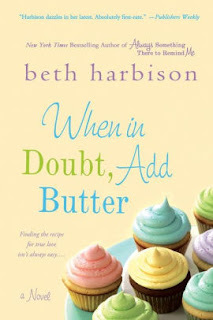 When In Doubt, Add Butter by Beth Harbison—Cupcakes I can give or take, but frosting? Can't resist it. Especially if it's nice, thick buttercream yum. So, yeah, I'm basically in love with this cover. The story sounds cute and really similar to The Wedding Bees. 4. 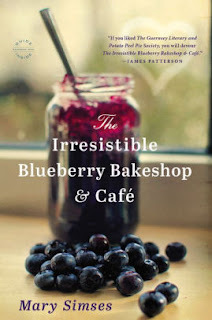 The Irresistible Blueberry Bakeshop and Cafe by Mary Simses—Jam isn't really my, well, jam, but I do love blueberries. Also cafes because they smell delectable. The title of this one also evokes warm memories of The Blueberry Cafe, a little place in Cagayan de Oro, Philippines, that a fellow exchange student and I loved to visit because it reminded us of home. Appropriate, since this novel is about a woman going home to fulfill her grandmother's dying wish. 5. 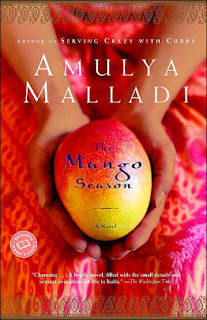 The Mango Season by Amulya Malladi—Speaking of The Philippines, I ate the tastiest (also smelliest—I'm looking at you, durian) fruit there. The mangoes were especially glorious. This novel is about a young Indian woman who's returning to her homeland after seven years to break horrifying news to her very traditional parents—she's engaged to an American. 6. 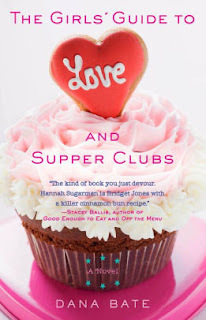 The Girls' Guide to Love and Supper Clubs by Dana Bate—Again with the frosting! Delish. This novel, which is about a woman who launches an underground supper club, sounds fun, too. 7. 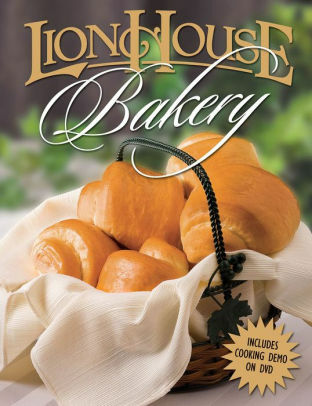 Lion House Bakery—I love this cookbook, one in a series featuring recipes from the historic Lion House restaurant in Salt Lake City. My favorite recipe is the one featured on the cover—crescent rolls. They're unbelievably good. My mother-in-law bakes the best ones I've ever tasted; even though I use the exact same Lion House recipe, mine never turn out as well. 8. Artichoke's Heart by Suzanne Supplee—Mmmm, chocolate. As long as it's white or milk, I'm in. The novel sounds intriguing as well. It's about an overweight young woman who embarks on a journey to change her body and her life. 10. 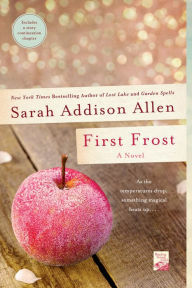 First Frost by Sarah Addison Allen—I've never read anything by Allen, but her book covers are all so pretty! Maybe that's because lots of them feature food. First Frost, a novel about sisters and their magical food concoctions, sounds engaging. What do you think? Do any of these covers make your tongue salivate and your stomach growl? Have you read any of my picks? What food-laden jacket art/books do you love? Leave me a comment on this post and I'll gladly return the favor. Happy TTT! I've heard really good things about Allen. I think I even have a couple of her books around the house. Now I just need to read them! Oh yes, these are all amazing covers. I bet they are all great reads, too. There's nothing like foodie fiction to keep you turning the pages. All but the one sound like really good reads to me. I love the idea of food magic bringing people together! I've seen The Coincidence of Coconut Cake EVERYWHERE for the last couple of weeks, and every single time I see that cake I crave it even more. The premise sounds fantastic, and since everyone is recommending it, I really should read it! These covers are making me so hungry!!! Great list! Right? It looks amazing. I seriously want to just lick the cover. Is that weird? A lot, actually. Some of them are delicious-er looking than others, though. I prefer photography to drawings and obviously desserts to everything else! What a great list! I'll have to check some of these out! Let me know what you think of them. The only one I've "read" is the Lion House cookbook and I haven't even looked through the whole thing. These books look so yummy. I could really use a cupcake right now. I love your list and I love that you went with yummy covers so I could salivate. If I’d participated I would have had to put Sweethearts by Sara Zarr because that sugar cookie made me sooooo hungry and The Particular Sadness of Lemon Cake because...well....cake. I totally forgot about SWEETHEARTS until I saw it on someone else's list. I would have included it if I'd remembered because SUGAR COOKIES. Yum. I didn't like the cover of LEMON CAKE all that much, so I didn't include it. Great take on this week's theme, Susan! I know you're not supposed to judge books by their covers but it's impossible not to when they look this good! 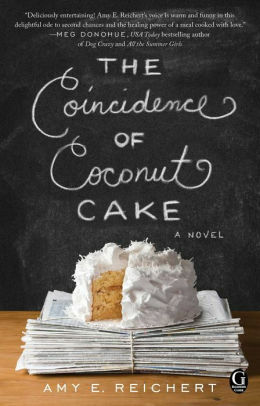 I've been meaning to read The Coincidence of Coconut Cake and I LOVED the blueberry one! I know! They look amazing. The best blueberries I ever had came from a little farm in upstate New York ... so delicious. Those covers are delicious looking! Man now I'm hungry... I just added The Mango Season to my TBR list; I'm always looking to diversify what I read and this novel looks really interesting! It does sound interesting. I've read very few books set in India, so this one definitely appeals. I know, right? I get hungry every time I look at them. Mmm...this cover art is making me hungry! The food all looks so gorgeously delicious. They do! I've heard food photography is actually a really tough hobby/profession, but these are so well done. Yum. 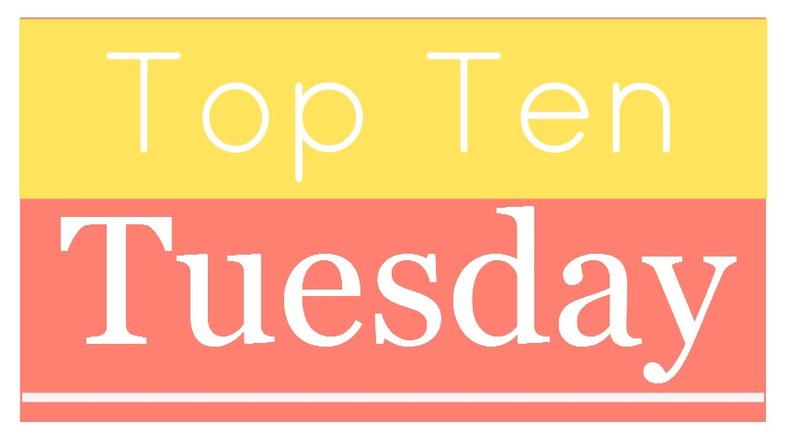 Do you have a book blog, Brittaney? Would you leave me a link if you do? I'd love to check it out. I read The Wedding Bees. It has an interesting plot, and some really interesting characters, but they all use the same appallingly rude language. It was disappointing. Really? Thanks for the warning. I hate it when books seem really sweet and PG-rated and turn out to be a lot more salty than expected. Sounds like this is the case with THE WEDDING BEES. Bummer. Love your list! I'm so hungry now after looking at these covers! Right? This week's topic has made me SO hungry -- not a good thing when you're trying to stick to your diet! Wow, these covers all look delish and are a feast for the eyes! I like your little twist on this week's topic! Yes these covers make me hungry!! I love First Frost and own Coincidence of Coconut Cake and need to get to it. Great list! I really need to read Allen's books. I've heard such good things about them. I definitely want to read COCONUT CAKE now, too. The Blueberry Bakeshop looks awesome, but it doesn't hurt that I like blueberries! Such an awesome cover though- and I like the cover of First frost as lot also. 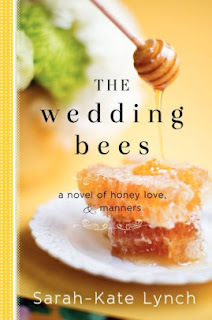 The Wedding bees I like for the cover too, I love honey with biscuits. That cover almost makes me hungry. Same for the cupcake one- they're so colorful and look delicious ha ha. GAH! All those beautiful foodie covers! I have to admit that Artichoke’s Heart also sounds really promising too! ♥️ Thanks Susan! I think so, too. I hadn't heard of it before putting this list together, but now I definitely want to read it. Oh my... those covers look delicious. 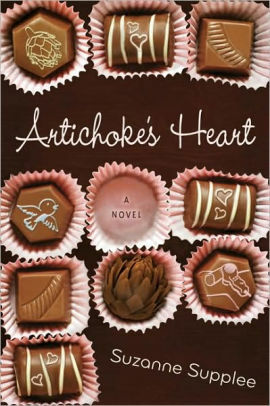 I'm always up for some chocolate similar to the cover of Artichoke's Heart. ;) First Frost looks really tempting also--but then, I'm a huge apple fan! Something about it makes it look extra sweet, though. Great TTT! Such gorgeous covers and they all make me hungry, especially the one with the basket of rolls on the cover. I think I could eat that whole basket by myself, haha! Oh yes. The Coincidence of Coconut Cake! I have that one on my tbr pile because of the cover. Yummy picks!